Dr. Leong graduated with a Bachelor of Medicine and Bachelor of Surgery (MBBS) from the National University of Singapore in 1991. He obtained his Master of Medicine (Surgery) and Fellowship of the Royal College of Surgeons (Edinburgh) in 1997. In 2001, he was awarded the Ministry of Health Manpower Development Programme (HMDP) Scholarship to train at Toronto Western Hospital in Adult Reconstruction in Hip and Knee Arthroplasty. Prior to entering private practice, he was Consultant and Director of the Adult Reconstruction (AR) Service at Changi General Hospital (CGH), Visiting Consultant to St Andrew’s Community Hospital and Spastic Children Association of Singapore and Clinical Lecturer of the Faculty of Medicine, National University of Singapore. He has also contributed his spare time to medical missions in Indonesia to the needy in recent years. His medical profile includes one year Clinical Fellowship in Hip and Knee Replacement/Revision Surgery at Toronto Western Hospital, 2002 - 2003. He extended his stay to 2004 to further his training in various hospitals, including Mt Sinai Hospital, the Orthopaedic and Arthritis Institute, and London Health Sciences Centre. He established the AR Service in CGH upon his return and served as Director of the Service. He pioneered the use of minimally invasive surgery in hip and knee arthroplasty, computer assisted surgery, alternative bearings in hip and knee replacement, various forms of partial knee replacement, revision hip and knee surgery and multi-modal pain management. In the field of research and training, he was the Principal Investigator in two on-going clinical drug trials (Phase II and III) on prevention of deep vein thrombosis after total knee replacement. He has also conducted courses and given lectures on many aspects of osteoporosis and hip and knee surgery. With respect to patient care, he has both chaired and assisted various projects aimed at enhancing patient safety and has attended Joint Commission International Advanced Practicum for Accreditation, Quality Improvement and Patient Safety in Chicago in 2007. Dr. Leong’s clinical interests include Adult Reconstruction and Joint Replacement. Dr Leslie Leong, orthopaedic surgeon at Gleneagles Hospital, explains 5 common health issues office workers face. 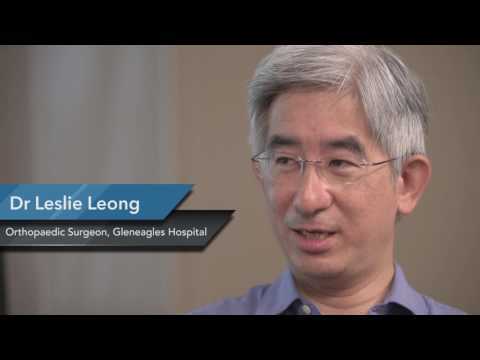 Dr Leslie Leong, orthopaedic surgeon at Gleneagles Hospital, answers important questions on how to stay safe and injury-free during the holidays.